Around the expanse of Lake Vembanad, the backwaters of Kerala are a unique and fragile-ecosystem unlike any other in the world. Enveloping the port towns of Alleppey and Quilon on one end, they stretch like a patchwork quilt clear across the state, up to Calicut in the North. Some are no wider than an arm span, navigable only by canoe. Others are dual carriageways, deep and rippling, sometimes broadening out into vast misty lakes, sometimes curling into twisting worm turns, hemmed by paddy fields and fed by a thousand fat streams from the high ranges of the Spice Mountains to the East. To really enjoy the backwaters we suggest at least a 2 night stay on the house boat. Not only can you really get the feel of the cruise, but you will also be able to visit temples, churches and villages on the way, or take a leisurely stroll into the lush and green paddy fields. 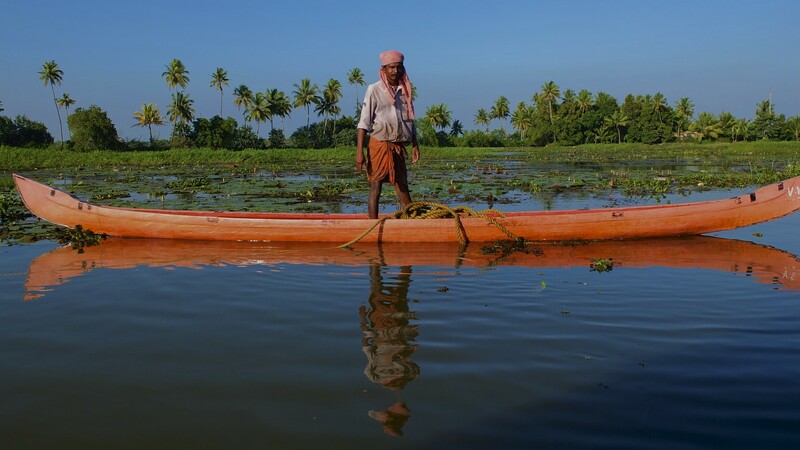 The boatmen will stop on the way to show you the various trades of the area, like Coconut Farms, Coir spinning and other typical small enterprises. As an added benefit you will also leave the one night trails of most of the boats, which makes the experience calmer and richer. Lovely shots . It is a serene and scenic place .